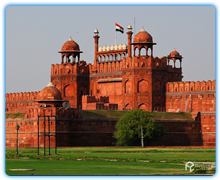 After Breakfast , full day city tour of Old and New Delhi includes visit to the Red Fort, Jama Masjid Mosque, Raj Ghat, Chandni Chowk market and Qutab Minar. and evening back to hotel, Overnight stay in Hotel. After Breakfast, morning explore the castle. Also visit some of the local havelis with ornately decorated interiors and exteriors in colourful frescos and paintings. Afternoon free. Overnight stay in Hotel . After breakfast drive to Bikaner, founded in 1488 by Rao Bikaji and encircled by a high battlement wall. Afternoon visit the 500-year-old Junagarh fort and the Palace. Overnight stay in Hotel . 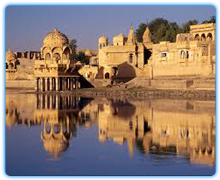 After Breakfast morning leave for Jaisalmer, one of Rajasthan's most exotic towns deep in the heart of Thar Desert. Afternoon free to walk through the streets and absorb the atmosphere. View magnificent houses with their facades carved from the yellow sandstone and decorated with painted murals.Overnight stay in Hotel. After breakfast drive to Jodhpur, at the entrance of the Thar Desert, and en route visit the Hindu and Jain temples at Osian. Remainder of the day at leisure to explore the narrow bustling streets and markets. Overnight at the Fortune Umed/Ajit Bhavan Palace. After Breakfast Full Day Udaipur City Tour, Founded by Maharaja Udai Singh in 1567, Udaipur is still very much a traditional Rajput town. Morning city tour visiting the City Palace, the museum, impressively carved Jagdish temple and Saheliyon- Kibari (Garden of Maids of honour). Overnight stay in Hotel. 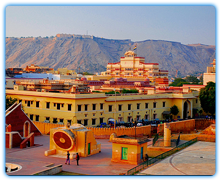 After Breakfast full day city tour visiting the Amber Fort (Elephant Ride) City Palace complex, museum, Hawa Mahal (Palace of the Winds) and Jantar Mantar Observatory and evening back to the Hotel. Overnight stay in Hotel . After breakfast leave for Bharatpur bird sanctuary. Afternoon bird watching by rickshaw. Overnight stay in Hotel. Morning bird watching by boat. Later leave for Agra visiting en route the deserted city of Fatehpur Sikri. Built in 1569 by the Mughal King Akbar, with its forts, palaces and Mosques. Optional visit to the Taj Mahal at Sunset. Overnight stay in Hotel . Morning tour of Agra visiting the Immortal Taj Mahal and the elegant fort. Afternoon leave for Delhi pausing at Sikandra to see the tomb of Akbar. Overnight stay in Hotel . Transfer to the airport for your flight home. International Flights: We would be pleased to assist you in arranging very competitive flights from the UK including regional airports.